In 1997 Eveline Macdougall visited the Great Falls Community Garden in Turners Falls. She looked at that garden, and thought of all the gardens her family had grown. She thought about her own frustrations trying to ‘squeeze plants into tiny outdoor spaces while longing for a real garden.’ Then inspired by the Great Falls garden she turned to her friend Suzette Snow-Cobb who helped start the Great Falls garden for advice. Macdougall then began creating a community garden by talking to people, and finding the right people to talk to. There were talks and more talks with the DPW about a site for the garden. None were found. Then used as an administrative building the Davis Street School lot had space and Macdougall noticed. She talked to the school department. Macdougall told me she was “getting an interesting political lesson on how to approach people.” Months passed of talks with the school board and the selectmen. Finally she got permission, but not before she kneeled down before them at a meeting. ‘You are wearing me down. Look at me. Look at my hands in prayer. I’m a really good community organizer.” With laughter, permission was granted. The selectmen approved the garden but she had to check in with all the abutters which she did. Approvals were finally given and after two years the Pleasant Street Community Garden was about to be born. In the spring of 1999 Rick Pascale brought his Gravely machine (they don’t make these anymore) to Pleasant Street and spent eight long hours breaking ground. Thirteen plots were marked off and immediately found gardeners to use them. When Dorothea Sotiros came along to help Macdougall as the garden grew, thirty-plots were in use. There was always a waiting list. There had been struggles and frustrations to get the garden and to maintain the garden, but Macdougall told me she wouldn’t trade a minute of her time in those first 15 years for anything. The gardeners who gathered there were refugees, immigrants, youngsters, elders, apartment dwellers like herself, and even prisoners from the jail. All were grateful and happy to have dirt for planting. Macdougall’s stories of trials and joy and thanks would take more than this column to tell. Then, as we know, the brick building came down, the gardens were removed and there was gnashing of teeth. Macdougall reminded the gardeners and everyone else that the town had been very generous in giving the land, for free, for all those years. Now the garden is coming back. The John Zon Community Center is sitting on that Pleasant Street lot. So far, there are lawns, shrubberies, and a large pollinator garden in front of the building. Behind the building is a rain garden, and the beginnings of a new Community Garden. Dorothea Sotiros is once again one of the organizers, along with Rabbi Andrea Cohen-Kiener and others who have met for the past few months as a Working Group. On April 22, Earth Day, there will be a celebration from 5 to 7 pm, to mark the beginnings of a new Community Garden. There will be music and snacks and conversation about What Next. Attendees will be invited to participate in one way or another. I met with Rabbi Andrea and we both looked at the 180 by 35 foot planting bed full of promise. It is not ready to be planted. Rabbi Andrea explained that the soil needs to be prepared this year before it is fertile and healthy. A healthy soil will prepare the garden for successful healthy crops next year. The Working Group has been grateful to NOFA (Northeast Organic Farming Organization) which has given them best practices advice about improving the soil. The Working Group is happy about the educational impact of the location of the garden. Those who come to the Community Center, and even those who walk by will have an opportunity to see the skills needed and used as the garden takes form. There will be a best practices workshop in composting for those who are interested. There will demonstrations of the different ways to garden. There is talk about vertical gardening. The Working Group is welcoming the thoughts, dreams and desires of those who will be interested in getting a plot in the garden. The soil will be worked this year with tools that had been used in the original Pleasant Street Garden, then patiently and hopefully stored while waiting for this renewal. Those tools will now be stored in a new shed due in part to the generosity of the New England Grass Roots Environmental Fund, and the Greenfield Common Good, both of which have given grants to the Community Garden. The town has absorbed the installation of the shed. Join the Community Garden party on Earth Day, April 22, 2019 from 5 to 7pm at the John Zon Community Center. An extra note. Eveline Macdougall has written a book about the Amandala Chorus which she founded. It is titled Fiery Hope and will soon be for sale. I am looking forward to her book, still to be written, about her adventures in the Pleasant Street Community Garden. Bloom Day! The purple, and gold crocus I planted last year have bloomed! The gold crocus is just about done, and the purple crocus no longer seem to be attracting the honey bees. I think the bees drank them both dry. This photo has a second purpose – besides showing off the blooms – I wanted a record of where they were coming up so I could plant more this fall. I love scillas – in large swaths. I am finding it hard to think why I planted three little clumps where they are easily stepped on. I think I will dig them up and replant them when they are done blooming. I have nothing else to celebrate this Bloom Day – except buds on the hydrangeas (newly pruned), on the lilac, viburnams, willow, Korean spice bush, and raspberries. Oh, yes, and startling green shoots of daylilies, asters, waldsteinia, and foam flower. Spring is coming. Slowly here in Massachusetts. The thermometer went up to 70 degrees this gray day, and heavy rains are scheduled for tomorrow. Once again my garden will be flooded, but not where these bulbs are blooming. Thank you Carol, over at May Dreams Gardens for inviting us all to show our gardens on Bloom Day! This is the third spring for our new gardens in the valley. 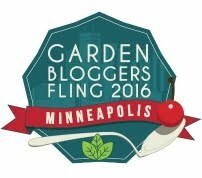 Garden Bloggers Bloom Day Early – or Late? Many of us gardeners eventually come to embrace shrubs because we need a low maintenance garden. I believe that in my new town garden, I have gotten a shrub garden that requires less work, and works with the limitations of my soil and space. I have concentrated on water loving shrubs like button bush, elderberry, and willow, but the shrub list is long. The earliest shrub to bloom in our neighborhood is Hammamelis or witch hazel. My neighbor’s witch hazel grows in front of her house and those twirly golden flowers are brilliant in a landscape where there is so little color. They began blooming at the beginning of March. Hamamelis x intermedia “Diane” blooms at the end of winter and has deep red flowers that will age to a copper tone. There is very little fragrance. This cultivar will be about 10 feet, wide and tall. “Jelena” is a coppery orange and also blooms in March. Depending on what you read the size of these witch hazels seems to fluctuate. I think we can count on between 10 to 15 feet. Pruning should be done after the blooms are done in the spring. The common Pearl bush, (Exochorda racemosa) can grow to six feet or more, and is covered with white flowers in early May in zones 4-8. Cultivars like ‘Snow Day Surprise’, and ‘Snow Day Blizzard’, are easy to find in garden centers. These will grow to about three or four feet and will bloom profusely and beautifully in May. There is a lovely pearl bush on the Bridge of Flowers but I cannot be sure of the cultivar. It is a stunning spring bloomer. Pearl bush will need pruning when the flowers fall off because it is a shrub that blooms on ‘old wood.’ That means the wood that will grow after pruning and will be ‘old’ the following spring when buds will set and bloom. If you prune a pearl bush in the spring, you will be throwing away all the spring buds. The issue of old wood and new wood has confused many gardeners. I just attended the Western Massachusetts Master Gardeners Spring Symposium and attended a talk by John Barry. Barry is a hydrangea lover and told us of the aggravation gardeners give themselves if they don’t understand old wood and new wood. I have known these terms for a long time, but they confused me. In Heath my first hydrangea was MothLight. In my timidity I did not prune it much, I just cut out dead branches, or branches that crossed each other. Mothlight did not seem to care very much. It just grew and grew to a height of ten feet or more with a wide spread. Barry said that was understandable. Mothlight is a hydrangea in the paniculata family. It blooms on new wood, and if you are not pruning it at all, it will keep growing and making that new wood to bloom every year. The thrust of Barry’s talk was really about the new smaller hydrangeas that are so useful for people with smaller gardens. He gave suggestions. One list was of new small hydrangeas in the Arborescens family which can tolerate some shade. These all bloom on new wood and should be pruned back to one or two feet in the very early spring, which is to say, now. They are hardy in our zone. Some gardeners may be familiar with Annabelle, a very popular ‘mophead’ with its large round flower. There are now two new similar cultivars. Invinciball has the biggest flowers and the sturdiest stems. Spirit II is the deliciously pink flowered Annabelle. Hydrangea paniculata is also called Hardy Hydrangea. All the hydrangeas I have grown have been paniculatas. Limelight, Firelight and Angel’s Blush are all doing well in my South Border. Barry said that Arborescens and Paniculatas are just about fool proof in our area. While I have full sized hydrangeas there are small paniculatas which have airier blossoms than arborescens. Little Lime, with green flowers, will only grow to four feet. Little Quickfire has flowers that turn from white to pink over the summer on a four foot shrub. BoBo has the largest white flowers in this group. Hydrangeas bloom all summer and into the fall. Callicarpa or American beauty bush is a relatively small shrub. It is said to grow to a height of three to six feet with an equal spread in zone 5 or 6 – 10. However, in our valley climate it will probably not grow much taller than three or four feet. A callicarpa has grown on the Bridge of Flowers for a number of years. I don’t know if the river provides some modifying warmth. Beauty bush prefers a lot of sun and a well draining soil. This small native shrub has insignificant white flowers in June. The real attraction in is the small purple fruits that appear in late August and last until hard frost.